Hey Guys! 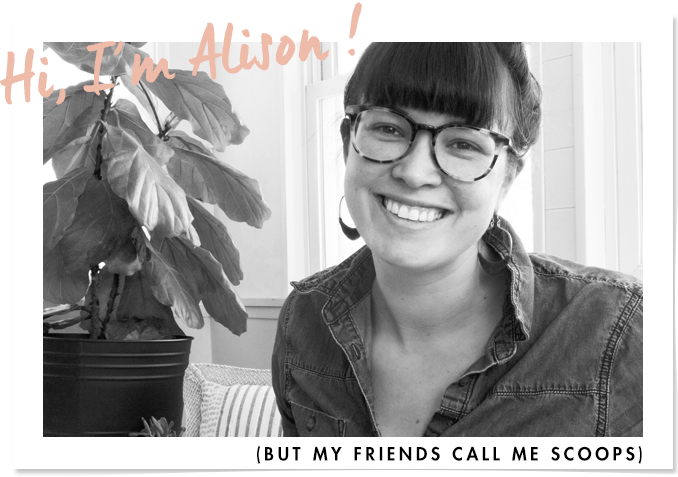 Thanks for all the sweet and honest feedback on my tidying post last week. 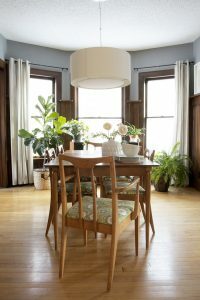 I would’ve done it either way but hearing that so many of you felt similarly about your houses, apartments, and spaces, encouraged me to jump right into the deep end! Ace was also super generous encouraging all us Ace bloggers to really get into a big project this summer. For me that was the garage. Last month I shared with you the exterior transformation and the big update on alley appeal. What’s that old saying? Oh yeah, “you can’t judge a book by its cover” or in this case “you can’t assume I would give any craps about the interior of my garage just cause I threw up a few windows, and added a-couple-a flower boxes on the exterior of it”. See below. I started with what is most likely the biggest mess in town, our garage. Since the spring it has become a dumping place and what was to be a temporary home for all our displaced basement items. When we began moving our basement into the garage earlier this spring we attempted to be organized in our process. Eventually as it became more crowded we would just open the smaller garage door and toss stuff in. Needless to say it was a complete and total chaotic mess, and everything needed to be taken out, gone through, and organized. I started by removing everything from the garage. I choose a time when I knew weather would be in my favor, the days were cool and the chance of rain was minimal. All the contents of my garage where moved into the backyard. I immediately began making piles for kids stuff, gardening supplies, tools & construction materials, garbage, and items to be donated. 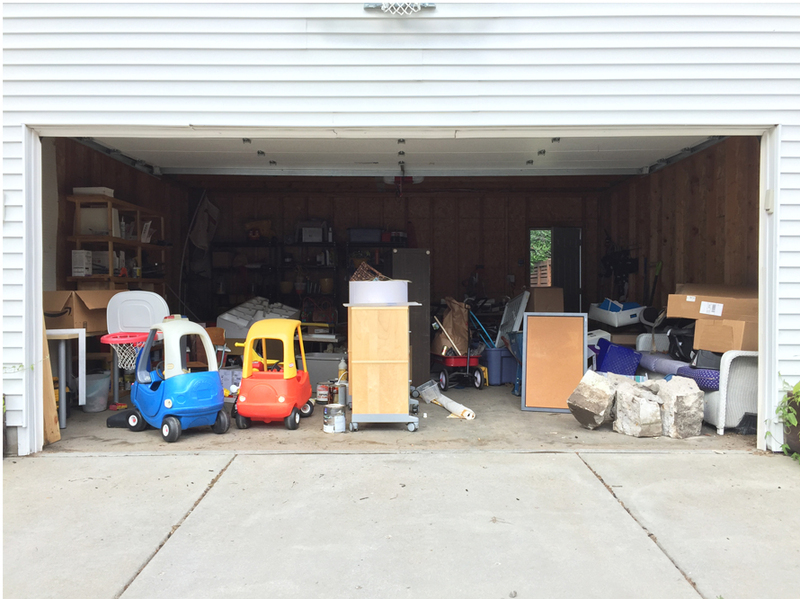 It was tedious but I felt encouraged the more and more I emptied the garage. After the garage was totally cleared out, I began thinking about the best way to use the space. I had quite a few shelves and tables from the basement that I was able to repurpose and I began thinking of storage in terms of zones. The biggest new additions to the garage was my tool collection. 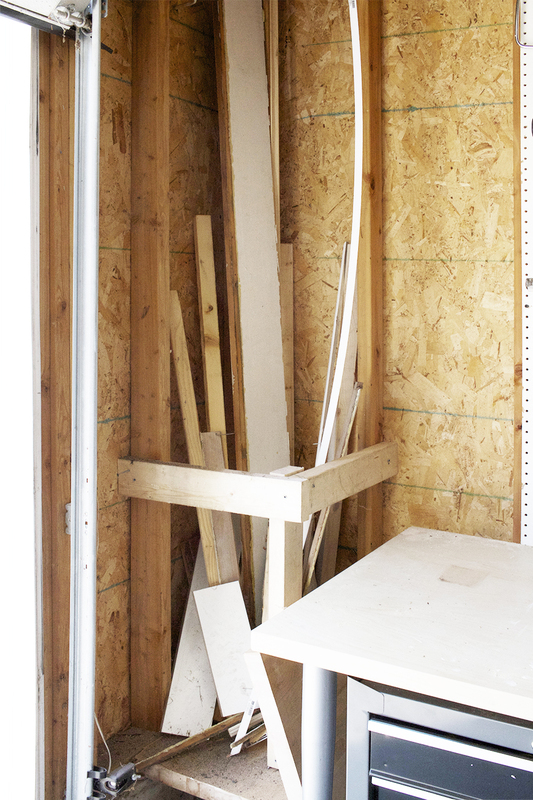 Prior to this spring all this handy stuff was making its home in what is now our laundry room. It was always the plan that in order for the basement to be realized, the tools would have to move to the garage. I needed to make myself new workspaces that were organized and very useful. 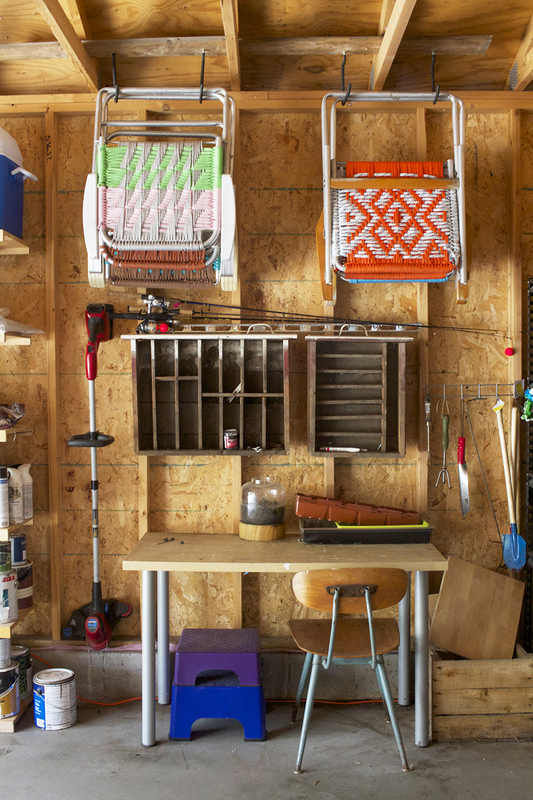 The pegboard was removed from our basement in the spring and I quickly hung it up in the corner of the garage so that I could use it again to make my favorite go-to tools easily accessible. Sitting below the pegboard is a table reused from the basement that for the time being has been appointed the title of ‘my miter-saw-table’. Under the table is a new upright tool box which will make me feel much more secure in storing my bigger more expensive tools in the garage since it locks up. Next to that is my wet dry vac which will be easily accessed for miter saw clean up. What a workflow! Next to the miter saw/tool situation is shelving (which came up from the basement) that now is a home to all of my other gear; tiling supplies, lighting odds-and-endds, wallpapering crap, sanding stuff, and lots of paint. I have plans of bringing a big chunk of that paint to the hazardous waste drop off tomorrow and then I’ll store the rest of it on shelving in the laundry room over the winter. I used some scrap wood to make an elevated scrap wood pile. I’ve been watching a lot of Naked and Afraid (which I highly reco) those survivalists are always elevating their shelters so I thought it would be best to elevate the wood pile so it wasn’t wicking up water and getting infested with creepy crawlies and stuff. I might be most excited about this garage addition. The other majorly sweet new zone is my gardening station. Not only do I have all of my gardening stuff organized on shelving (see below) but I also decided to use this table to make myself a work bench. Above the table are the drawers saved from the original 105-year old workbench that was in the basement. I think it’s pretty cool, and if Nicole Curtis and I were bros, I’m pretty sure she’d be patting me on the back, although she’d probably be pissed that I threw away the rest of the work bench, womp. Guys! 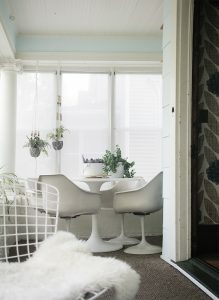 Don’t let them make you feel like you need to get fancy storage bins from the container store, especially in a garage. Reuse containers and if you feel inspired, write what’s inside of them in some sort of overly eager and quirky hand lettering. 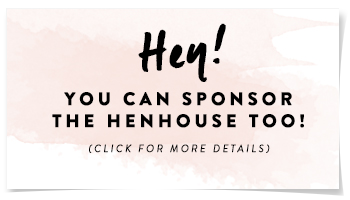 I mentioned it last week, but my goals for this house don’t end at just tidying, I also want to repair all the little stuff that’s been driving me nuts. In the garage that was the weather proofing on the big garage door as well as the threshold and weather stripping around the smaller entry door. This always seems to happen: so many of the projects that I try and constantly avoid turn out to be the easiest quickest and least expensive fixes. 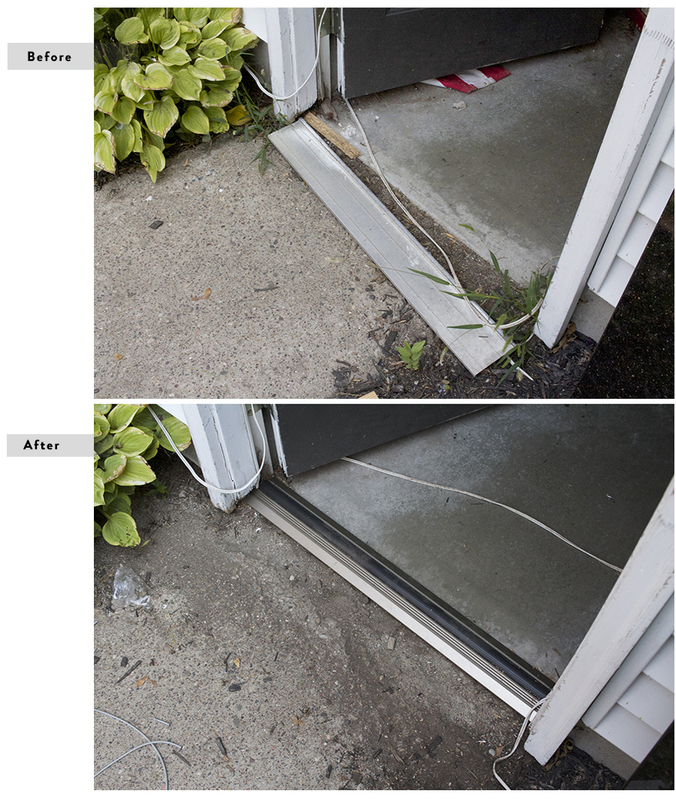 Replacing the weather stripping on the big door was as easy as sliding one piece of garage door vinyl out and sliding a new one back in. 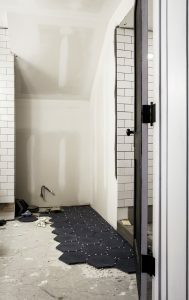 The smaller entry door was a little more tricky as I needed to chop down this metal threshold with a jig saw and then drill into concrete flooring, but still, it took minutes. 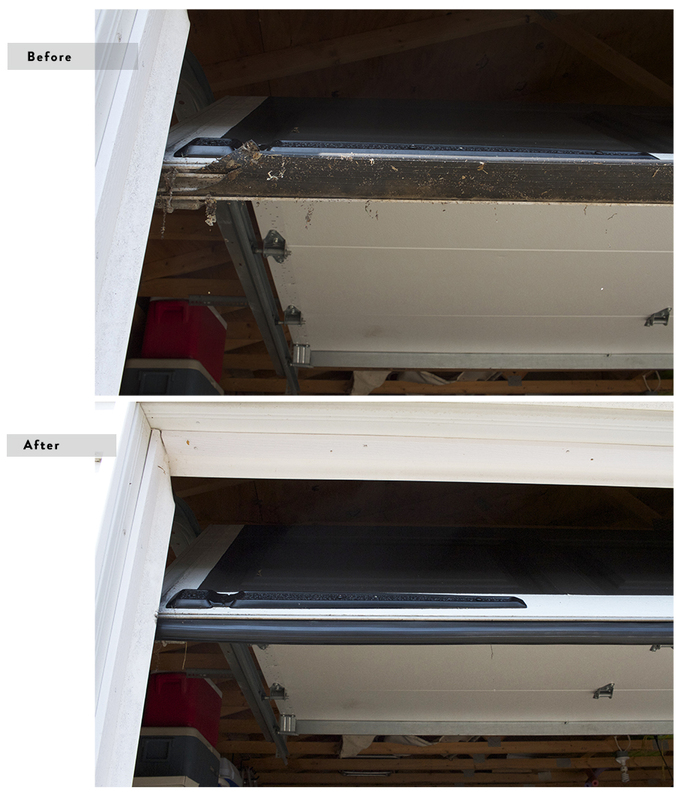 Replacing the weather stripping was a breeze and I’m confident that snow, ice and dirt will not be as abundant in our garage this winter as they were last. I was able to update the entry door and the big garage door in less than half an hour and the difference it makes to the space is huger than you’d expect. 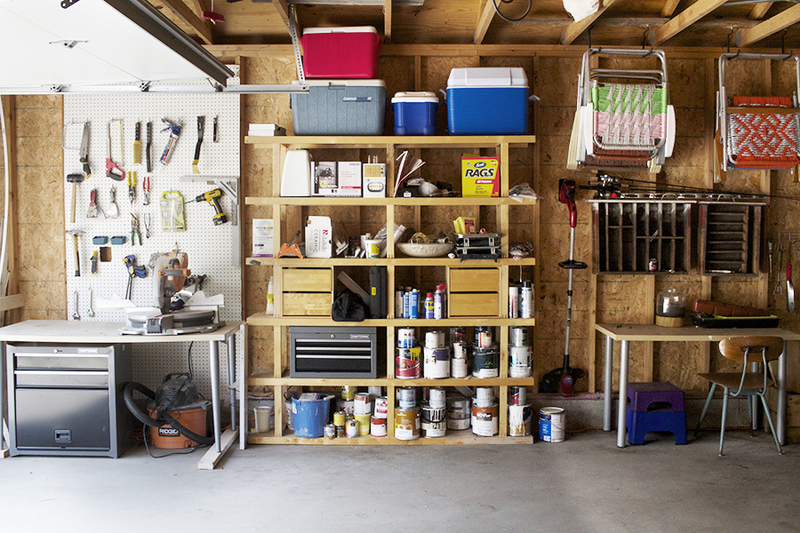 It takes the garage from appearing forgotten and uncared for to seeming well loved of and happily maintained. Stay on top of your home-owner-to-do-lists people! It feels good. I was able to order a few sections of this metal tool organizer from Ace. It was such a game changer for me. 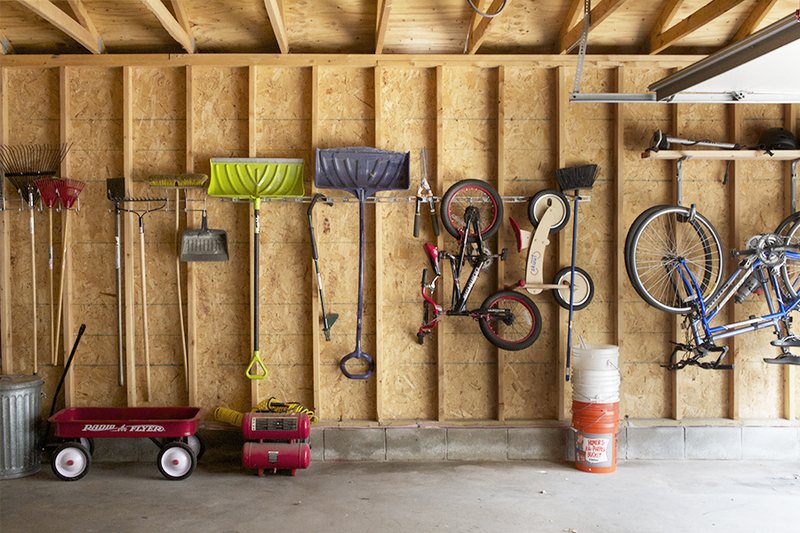 Now I was able to get all of my gardening tools, shovels, bike, saws and pruners, up off the floor and hanging vertically and nearly flush on the far wall of the garage! This will all be easy to access and leave lots of room for car parking which I’m pretty sure is what I hear garages are intended for. We actually got our bikes up off the ground! Can you believe it? 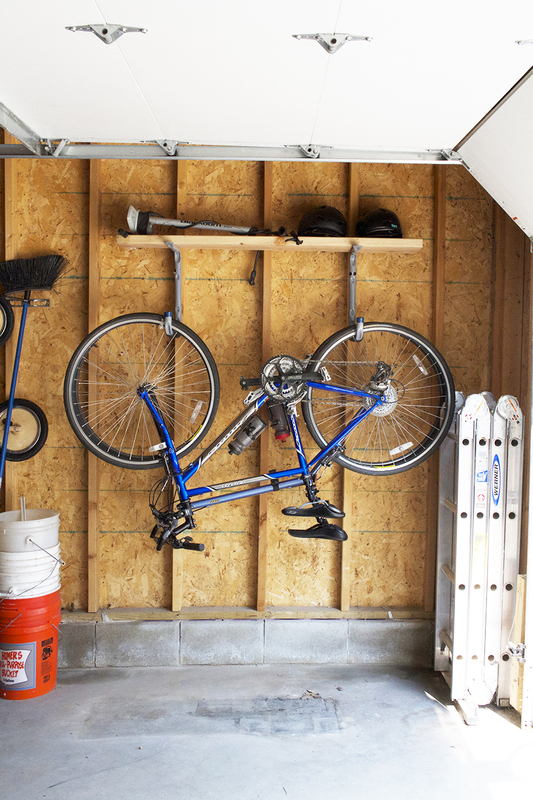 I used a pair of these shelf brackets from Ace and was able to mount the bikes on our wall. 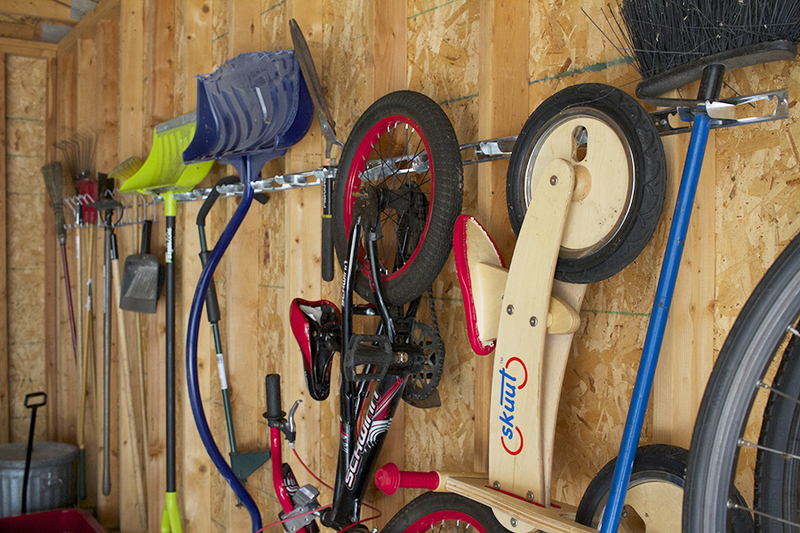 I grabbed a piece of wood from my scrap wood pile to use as a shelf above and now all of our bike gear, helmets and pumps are all organized, together, in one amazing place! I didn’t feel like a real home blogger until last weekend when I made my first trip to the city dump. Before then we’d use those bagster things in lieu of a trip to the junkyard. This time we had lots of concrete to get rid of and we didn’t feel like coughing up the $100 plus bucks it costs for the bagster. 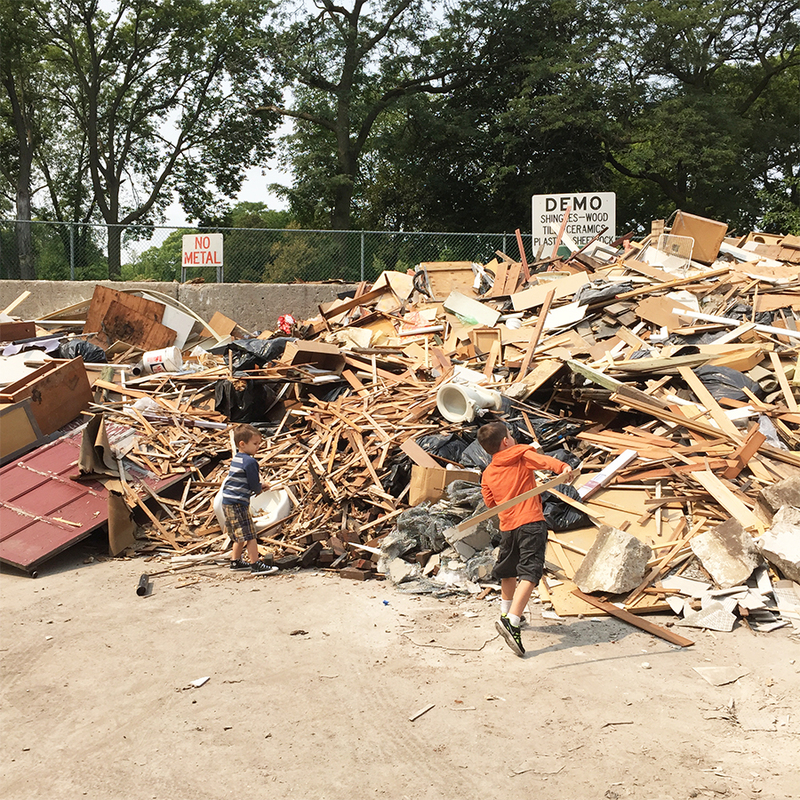 We had to take a family trip to the dump, and to our surprise throwing chunks of stuff at a big pile of garbage turned out to be really fun and slightly dangerous! 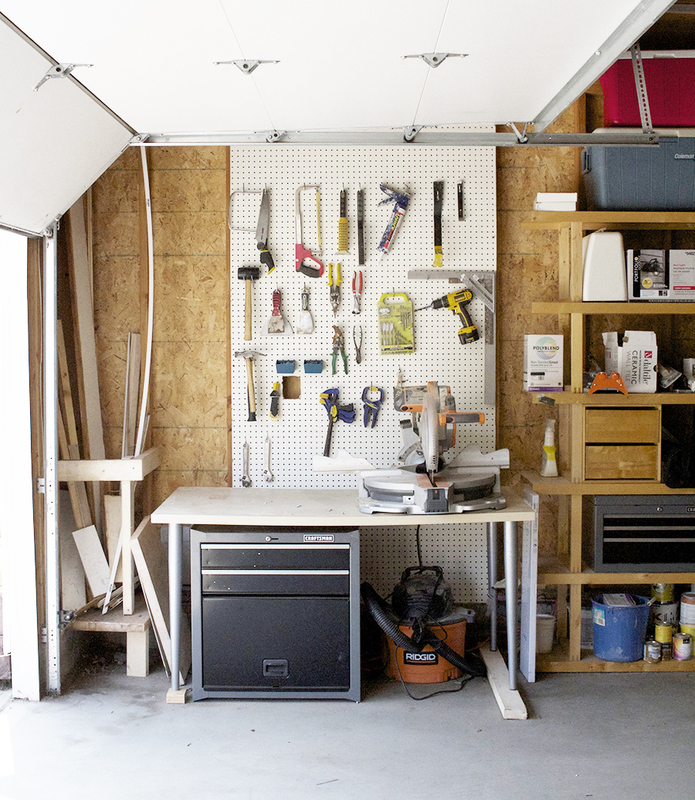 It took over a week to get this garage to where it is now, but the satisfaction and organization that it is bringing to my life is totally worth it. I’m actually a little excited to tackle the next part of my punch list. The Giveaway has ended – Congrats to Annie! the garage looks so tidy! That is a great feeling to de clutter that space. I gotta do that weatherstripping stuff before it turns into winter again! I’m a new reader, so I’m sorry if I missed this, but did you MAKE those colorful lawn chairs hanging in the background? They are amazing. Does your site have more info on them somewhere? Thanks! Haha, that “transformation” gif you made is awesome. 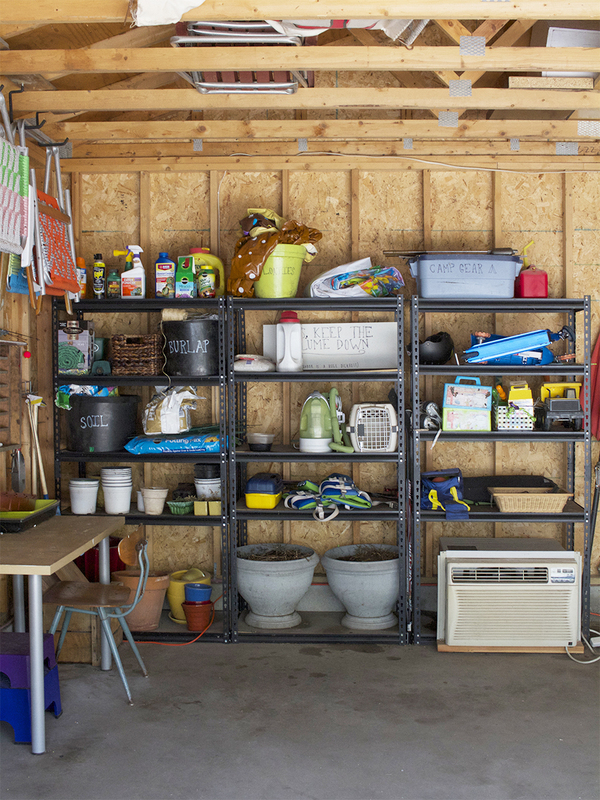 And your garage looks great! So satisfying! And I love the elevated elevated scrap wood pile. Fun post. Thanks for sharing the details and frugal ideas. 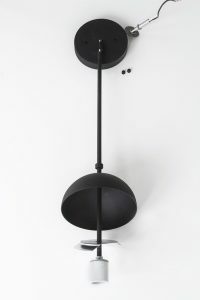 Older Post All I want is Tidiness!